One Hardworking Little League Team Will Earn the Chance To Participate In A Clinic Hosted By Cincinnati Reds Outfielder Ken Griffey, Jr.
Upper Deck, known globally for delivering award winning sports and entertainment products, along with The BallPark Advertising Agency have teamed up with Cincinnati Reds centerfielder Ken Griffey, Jr. to create a national television spot to launch Upper Deck's newest baseball card set Power Up! Baseball. Power Up! Baseball includes the top MLB players with heroic and oversized features and is designed to introduce youngsters to sports card collecting. The :30 spot takes place in the dugout at The Great American Ballpark in Cincinnati and shows youngsters trying to match wits with the Reds outfielder and best him while trading baseball cards to build their sets. The television commercial will begin airing the week of May 18 for four weeks in markets around the country. "Television is the perfect medium to reach today's youth," said Kristy Watson, advertising manager for Upper Deck. "Together with The Ball Park and Ken Girffey, Jr., we were able to collectively create and produce an advertisement that will reach youngsters and get them excited to collect Upper Deck branded sports cards." Power Up! Baseball, is an easy-to-play sports card product that offers a unique, exciting way to collect cards via a points program that will be redeemable for big prizes. The 100-card set, gives kids the opportunity to start their card collection or trade with their friends to build the best team based on points stated on each card. The cards are regular, rare, ultra rare, super rare and mega rare. After logging onto www.upperdeckkids.com and entering their cards, they can track their team. Players have an opportunity to win prizes such as a clinic with Ken Griffey, Jr., signed memorabilia and Xbox game units. 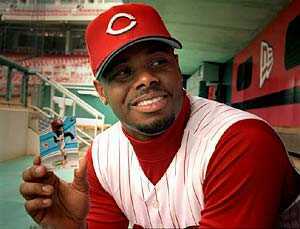 Little League teams across the country are encouraged to purchase and submit their wrappers from 2004 Upper Deck Baseball Trading Cards for the opportunity to win the Grand Prize of a clinic with Griffey, Jr.